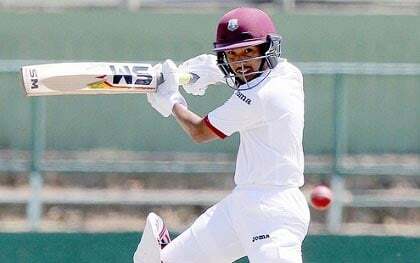 MONTEGO BAY, Jamaica, CMC – Head coach Graeme West has urged his players to make the most of the opportunity by getting among the runs and wickets, as West Indies A chase a series win in the upcoming three-match four-day “Test” rubber against touring Sri Lanka A. The two teams face off in the opening match at the Trelawny Multi-Purpose Stadium starting tomorrow with several regional players hoping to press their claims and impress selectors. Left-hander Vishaul Singh … hoping to impress against after making his Test debut against Pakistan. “Sri Lanka has come with a good mix of experienced and very promising players, so it would be pleasing to record a series victory against any them or any other visiting side for that matter,” the Englishman said. Singh was the leading scorer of the Windies A tour of Sri Lanka last year with 324 runs at an average of 64 while Brooks gathered 249 runs an nearly 50 per innings. Hodge, meanwhile, was one of seven batsmen to pass 600 runs in the last first class season with Campbell compiling nearly 500 runs. Two relatively untested pacers, the Jamaican pair of Reynard Leveridge and Oshane Thomas, have been included in the squad and West said the series would provide both with an important challenge. “It will also be a big test for two of our fast bowlers, Reynard Leveridge and Oshane Thomas,” West explained. The series represents the first one in 12 months for Windies A, following their full tour of Sri Lanka last year October. Of that squad, several players progressed into the Test arena, featuring in series against Pakistan in the Caribbean and on the recent tour of England. West urged players who had already made their mark to reproduce their form against the Sri Lankans, noting this was the only route into the international side. “The players that have progressed to the senior team over the last 12 or 18 months have done it on the backs of some consistent performances in “A” Team matches,” he pointed out. “More of the same is required from the team, as a collective to do well, but with strong contributions from each individual. The second “Test” bowls off at the same venue on October 19, with the final match – a day/night contest – set for Sabina Park in Kingston from October 26-29.